When Hurricane Katrina hit New Orleans, the rest of the country could only read about the devastation suffered by residents in addition to the damage to homes and businesses, but for those directly impacted, it was a life-changing event. Even though a work of fiction, the story follows one main family through their lives leading up to the hurricane, their fight for survival post-disaster, and the shaping of their new lives after rebuilding and putting their world back together. The story highlights a love story, an unfaithful marriage, a student’s struggle for an education at Tulane University, deceit, con artists and the mismanagement of local government, all within the backdrop of one of the most powerful natural disasters ever to hit the country. It is a gripping tale peppered with factual circumstances that will place the reader into life in New Orleans with its rich history and determination to survive. FALL ORIENTATION IS ALWAYS AN exciting time for incoming college freshmen everywhere, especially so at Tulane University. New Orleans is a great place for personal discovery. It is an ancient city that embraces change, but clings to the history of traditional ways as Spanish moss hangs eternally from the branches of Audubon Park oaks. Moss absorbs nutrients from the steamy dampness of summer heat. Living in New Orleans challenges your soul in a similar way. Breathe deep; it’s in the air. Three hundred years ago, Bienville founded New Orleans on a small plot of high ground surrounded by swamps and marsh lands claiming it for the King of France. Since then, a determined Mother Nature has contentiously fought epic battles to reclaim it. She slings hurricanes at New Orleans like a heavyweight champion throwing knockout punches. In recent history, the worst storms have been made more destructive because of the environmental devastation encouraged by the petrochemical and shipping industries. People living in low-lying areas of the southern parishes used to gravitate to the relative safety of New Orleans and her strong levees. This was before the oil and gas industry dug thousands of miles of canals crisscrossing the marshes and swamps. Then the back swamps to the north of the city were drained to create the neighborhoods of Lakeview, Gentilly and New Orleans East, encouraging growth and development in below sea-level areas close to the lake. Adding insult to injury, global shipping interests and the Army Corps of Engineers dug the Intercostal Canal and the Mississippi River Gulf Outlet, bringing seawater to the doorsteps of New Orleans. Hurricanes have a way of entering the history of New Orleans and becoming a part of the fabric of our culture. We remember Audrey, Betsy, Camille and Katrina the way other cities memorialize hometown athletes. Here, hurricanes mark the time. History rolls along and the storms, they keep coming. They considered the hurricane of 1915 to be a hundred-year storm. They were almost right. Katrina slammed into New Orleans 90 years later. Many hurricanes start off as low pressure systems moving westward across the African continent, enter the Atlantic, and under the right conditions become tropical disturbances. The warm waters of the Caribbean and Gulf of Mexico are perfect for nurturing killer hurricanes headed for Louisiana. Until the 1950s, they were named for the year in which they struck land. During the Hurricane of 1915, a steam locomotive and seven passenger cars were caught unprepared on a stretch of track near Rabbit Island in the Lake Catherine area. The engineer tried to make a run for New Orleans, but the 130 mph hurricane force winds blew the speeding train off the tracks into the swampy marsh. Some passengers survived the flood waters by climbing Bald Cypress trees plentiful in the swampy land. Twenty-two people were never found. Eight of the lost were children. They were included in the 275 killed in South Louisiana that night. The heavy engine and passenger cars sunk deep into the soft muck and disappeared. Recovery was impossible. The train was forgotten and considered an urban legend until the 1990s when a work crew laying fiber optic cables along the track right-of-way discovered the lost engine. Hurricane surges enter Lake Ponchatrain from the Gulf through Lake Borgne and Lake Catherine. The lakes are connected to the Gulf by a short, eight-mile-long, deep water tidal pass called the Rigolets. It is a French word for trench pronounced in New Orleans as the ‘Rig-uh- leez.’ During the 1915 storm, a small, wooden-hulled cargo ship with twelve crewmen searched for the channel leading to safety from the rampaging open gulf waters. The captain manned a searchlight looking in vain for channel markers that were already washed away; visibility was zero. Water began to flood the engine room. Radio distress calls went unanswered. “Full revolutions! I need full revolutions. Hard rudder!” the captain barked desperately to the helmsmen. The watch officer reported the flooded engine room and the wheelhouse was taking on water from broken windows. The ship was never seen again. Over the years, local fishermen have reported hearing a ship’s bell and emergency horn. Some have claimed to have heard a captain shouting orders. The ghostly sounds always stop at 11:46 p.m. The eye of the 1915 Hurricane passed directly over the Rigolets and into the city of New Orleans at that exact time. In 1969, the first year of the Jazz Fest, the Ole Miss Rebels led by quarterback Archie Manning defeated the Arkansas Razorbacks 27-22 in the Sugar Bowl at Tulane’s Willow Street Stadium, Neil Armstrong walked on the moon and Hurricane Camille slammed into the Gulf Coast. Camille formed in the usual way, but became a powerful Category 5 with winds over 190 mph, and carried swarms of tornados as it approached New Orleans. It was on a deadly track heading for Lake Borgne in a westerly direction, straight up the Rigolets. The highest wind speed was reported by a Transworld Drilling Company platform about twenty miles east of the storm’s path at 197 mph. It was a worst-case scenario for New Orleans with a twenty-foot-high wall of rising water potentially forced into Lake Ponchatrain. The protective levees and pumping stations surrounding the city would surely fail. New Orleans was spared at the last minute as Camille turned east, placing the city on the weak side of the storm’s eye. It clipped the boot of Louisiana and slammed into the Mississippi Gulf Coast. Bay Saint Louis, Pass Christian and Long Beach were destroyed by the wind, tornadoes and surge. Wind drove pine needles into the walls of homes as if they were ice picks. The mayor of Pass Christian said he was mayor of a city in ‘name only,’ as everything was destroyed. Camille came ashore on the night of August 17, 1969, remembered as Woodstock weekend everywhere else. We all assumed no storm could ever top Camille, until 2005 when Katrina took an almost identical path. 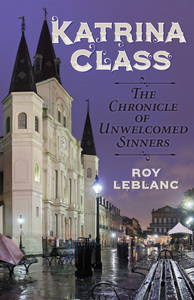 "Astute... Courageous... Roy LeBlanc doesn't pull any punches."